Well, I'm really sorry if you are disappointed, but Frany's flower is not going to work into this project, mostly because it is too big and the proportions are way off to look right. 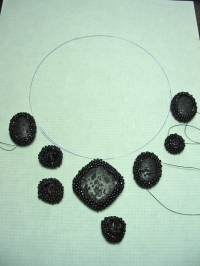 I will have to use size 15/0 seed beads for the ferns and flowers. The other reason has to do with matching the other colors that I want to use in this necklace. I absolutely love Delica 689 and the flower she made with them, but it's an extremely hard to match color and doesn't look nice close to any of the other greens that I have to use for the ferns. Merci Frany! :-) Je suis désolé que je ne peux pas utiliser ta fleur dans ce collier comme j'avais espéré. Je pense à la fin que je devrai utiliser le fil en métal pour monter tes fleurs, mais je ne ferai pas probablement un collier… j'ai une autre idée. Just checking to see how the now projest is going so far it looks really great. I am sure that you will find some thing lovely to do with Frany's flowers. Blog is looking good so is the project I am looking forward to seeing the end result. james says it looks great so far to. Thanks! I have another idea for Frany's flowers that might work out, but it will take some time before I can try it, this project is going to keep me busy for a while.